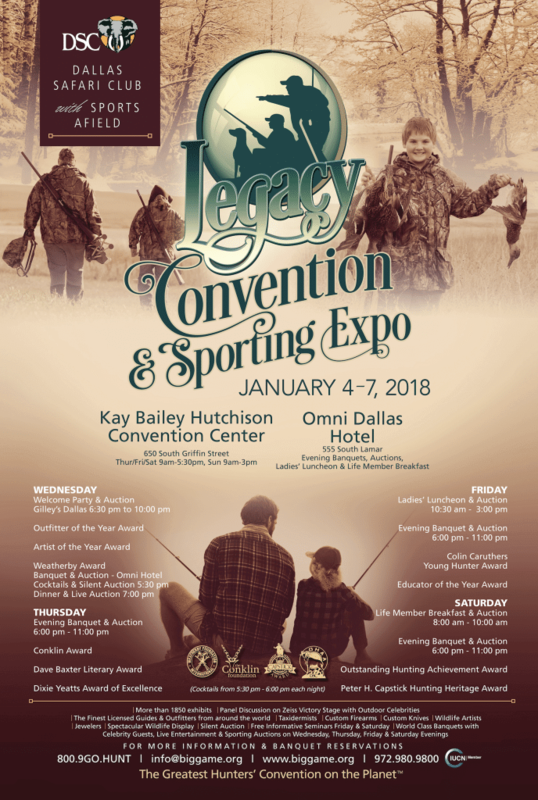 NICHOLAS AIR is proud to be exhibiting at the Dallas Safari Club Legacy Convention and Sporting Expo in Dallas, TX on January 4-7, 2018. If you are in the area, we would love to speak to you about the benefits of becoming a NICHOLAS AIR Member. Come visit booth 4601 and learn more about why NICHOLAS AIR is the perfect private jet service provider for all your travel needs. If you’d like to learn more about the DSC or NICHOLAS AIR, please fill out our contact form or email [email protected] and one of our Aviation Experts will be in touch soon. Since 1972, Dallas Safari Club has been the gathering point for hunters, conservationists, and wildlife enthusiasts. Their mission is to conserve wildlife and wilderness lands, to educate youth and the general public and to promote and protect the rights and interests of hunters worldwide.